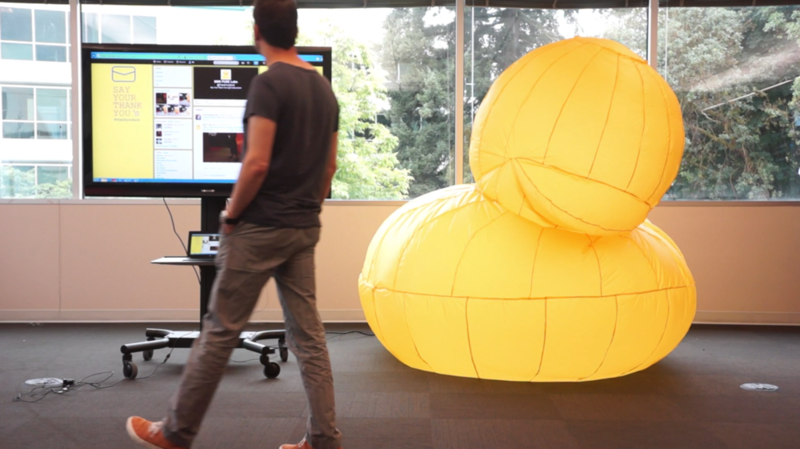 Thank You Duck is an interactive installation that encourages people to share gratitude. Astonishing the audiences by sheer size of the huge inflatable sculpture, this project encourages people to show their gratitude by sending a tweet. The goal of this project is to empower groups of people through awareness of the little things that make us human and this sense of bonding-ship will help the group grow more collaboratively by recognizing each other. The project was developed as a part of my research project at Microsoft Research Fuse Lab 2013 and mentored by Jenny Rodenhouse and Richard Zaragoza. Without any gratitude shared among people, the Thank You Duck will gradually lose its life(physically deflate), which in return, garner sympathetic response by the witnesses. The only way to bring it back to life is to share gratitude with one another. 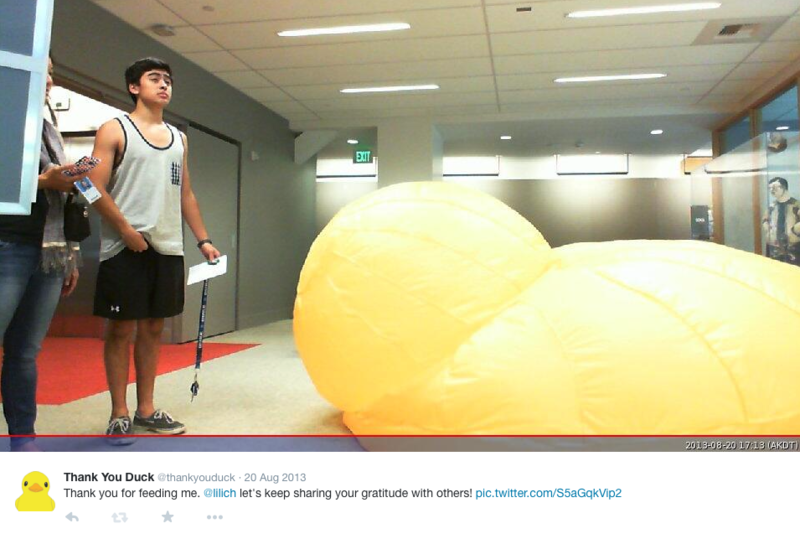 Thank You Duck deflates gradually if no one thanks to each other within the community where it has been installed. To stay in shape, Thank you duck requires people to share at least two or three thank you messages. 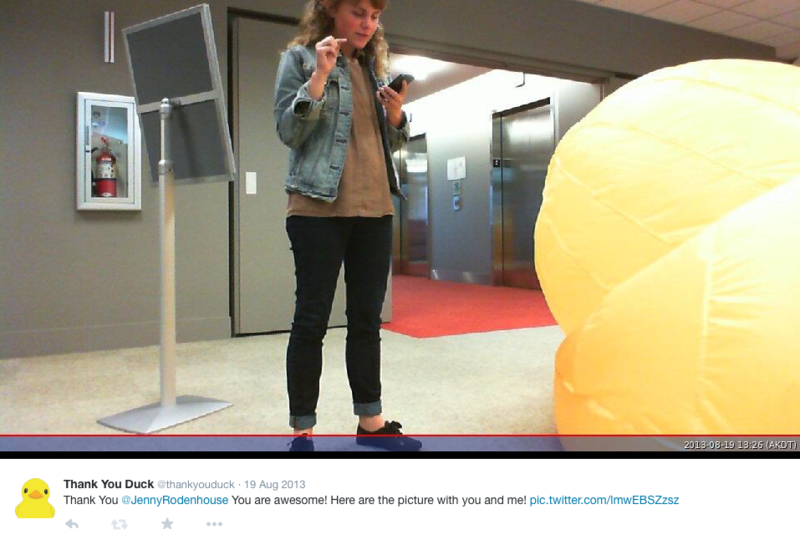 When the thank you duck receives a tweet message to @thankyouduck, the half-deflated duck will start inflating as well as capturing the moment to reply to the user who sent a message to @thankyouduck. Encouraging people to express gratitude more often will gradually become less effective, once people get familiar with the repetitive interaction or when it becomes an imposed task. To keep the magical moment for people, Thank You Duck will be installed at the same location only for a week, then new location will be assigned. This project was initially developed for Microsoft Research building to create more appreciated environment for resident researchers by sharing their gratitude one another. However, thanks to the playful characteristic of this project, Thank You Duck could be installed for children's education showing them how rewarding it is to express gratitude to their classmates and families. I was wondering why most cultures have so many rules to punish misbehavior while having so little for rewarding people with kind and exemplary behaviors. What if we can create a social platform that induces people express gratitude more often and leave the history of gratitude as a lineage of goodwill and share together? Would it make any difference? Why don't we express gratitude? When we enter into a competitive environment, it gets harder to express gratitude. Besides, expressing gratitude in person is not easy. We get shy. Furthermore, when we are grown up, we tend to take others’ effort for granted. With all these things in mind, how can we encourage people to express gratitude more often? For the first iteration, I wanted to figure out how people would response to a personal thanks message in the form of paper with hand-written message. Besides, I was wondering how the one who received the message would response to it. Would they pay it forward? or forget about it? Then, I created a paper prototype that asks people to write a thanks message to others when they received one. To initiate the project, I wrote a few personal thanks messages to co-workers to express my gratitude as they helped me in the past few days. For me, the magical moment in this experiment, was finding an envelope on my desk and opening it up and reading a sweet message about the experiment I did. People really liked to received a personal thank you message whether the message was regarding to their job performance or little things. watching the chain of the interaction among people were interesting. Based on the analysis of first prototype, I found a few key elements that I need to implement for the next prototype. Personal messages, tangible objects and tracking a chain of interactions. inKind consists of two different elements. One is a coin-like object, inKind coin. Another is an inKind web-application. An inKind coin is in the center of interaction as people would give it to others as a sign of their gratitude. Also, it’s a key access point for people who received the inKind coin to the inKind web-application where people can share gratitude. Within inKind web-app, people record their personal gratitude message or check the received one. The role of inKind coin is an access point to the web application. The inKind web-app url is engraved at the front of coin along with unique digit-code to idenitfy each coins and the digit-code will allow the user who received the inKind coin access the personal thanks message recorded for them. inKind website is where people can record their personal thanks message to others in video, photo and text format or check the received message. The one who received the inKind coin as a sign of gratitude not only will get a message for them, but also see the entire chain of interactions happened with this particular inKind in the past. Although the last iteration was discontinued due to the critical caveat, it let me recognize the important elements that I have overlooked. Instead of aiming for wide range of arbitrary audiences, the final iteration must be narrowed down to the target audiences. And the next project should be easy for people to participate while implementing all necessary elements found in the past. In 2012, I created an inflatable sculpture, “ You matter to me ”. 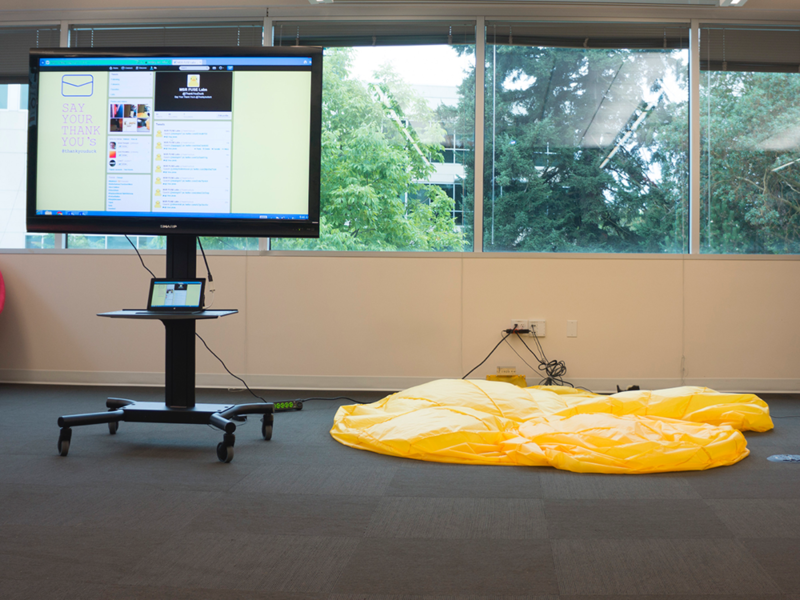 The inflatable responses to the existence of people around. I learned that an inflatable sculpture could evoke diverse emotions depend on its status. When the inflatable is on deflated, it often evokes pitifulness, emptiness. 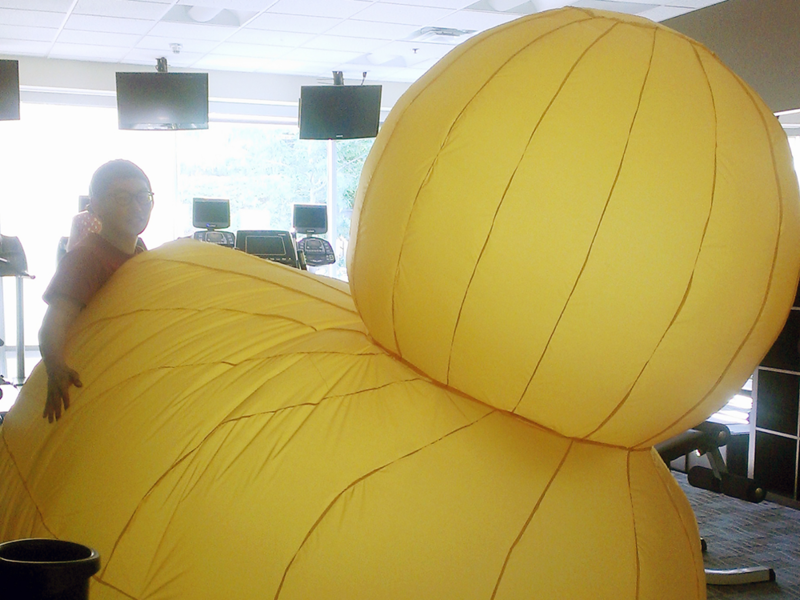 On the other hand, when the inflatable is fully inflated, it brings playfulness to the installed environment. I thought these emotional response to the inflatable can be used for my final iteration. What do we feel when we face gigantic sculptures? It’s impactful, eye-catching and playful. 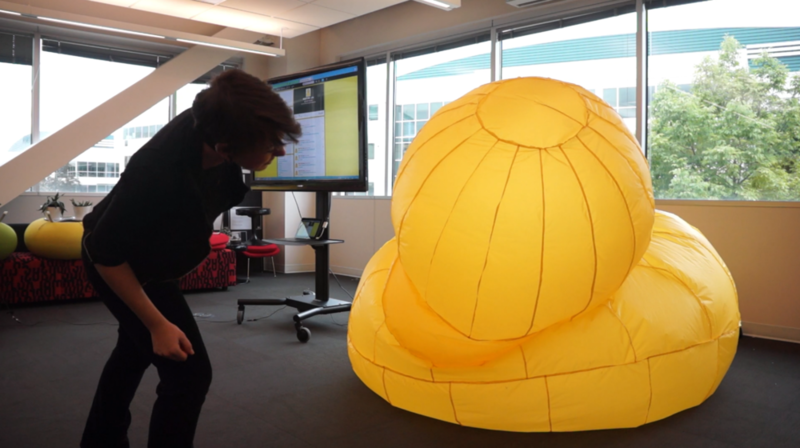 By up-scaling the size of the inflatable sculpture, I wanted to amplify the emotional response. 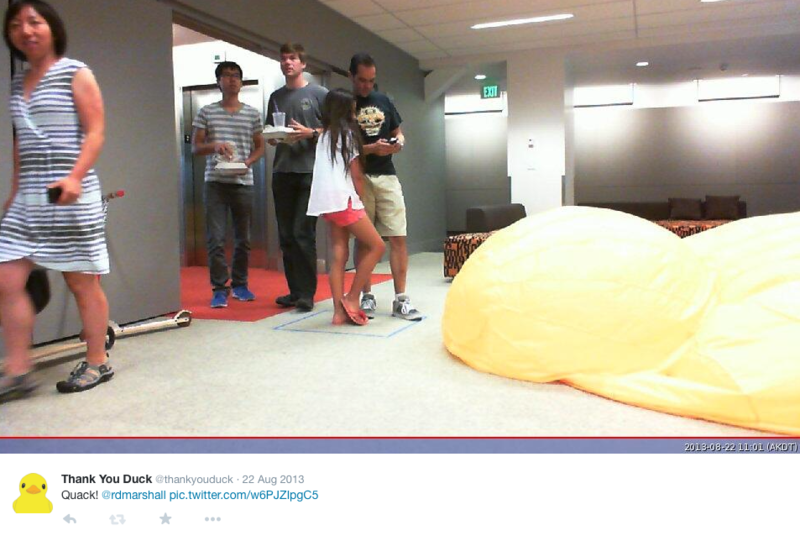 The next thing to decide is a shape of the inflatable. The shape of the inflatable has to be friendly, playful and somehow take us right back to our childhood memories. As the result, the rubber duck has been chosen for its familiarity and playfulness. Also, the color of the rubber duck has affected on this decision making. Whenever people try to send a tweet message to express gratitude to their colleagues, they will always see the half-deflated duck comes back to life (pleasing) with playful music and this will be a reward to their nice gesture. And those people who received a thank you message will get another positive feedback. They will see all interactions happened with thank you duck by reading the tweeter feed as well as their own thanks message from their colleagues. The first step to build the thank you duck was to find a duck model. Instead of modeling a new duck, I chose to use the existing design for its familiarity. 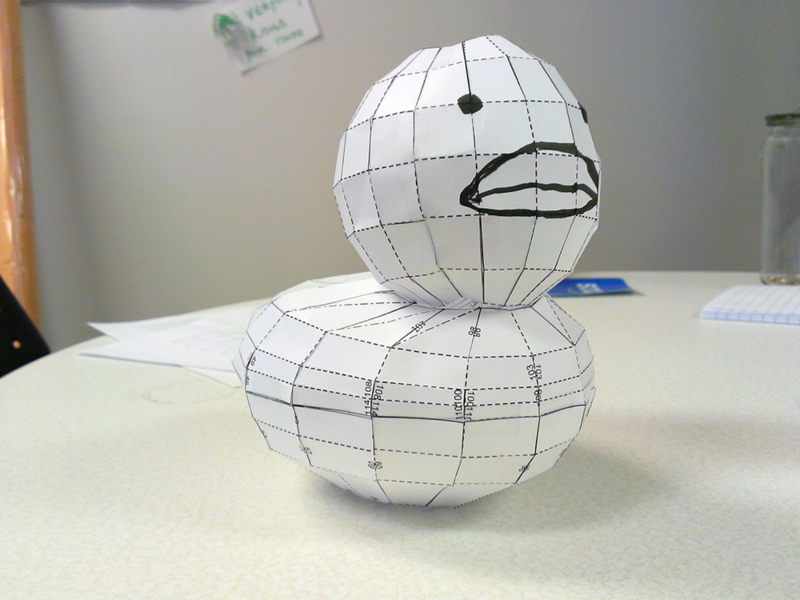 The next step was to transform 3D duck model into 2D scheme by using a software, Pepakura*. 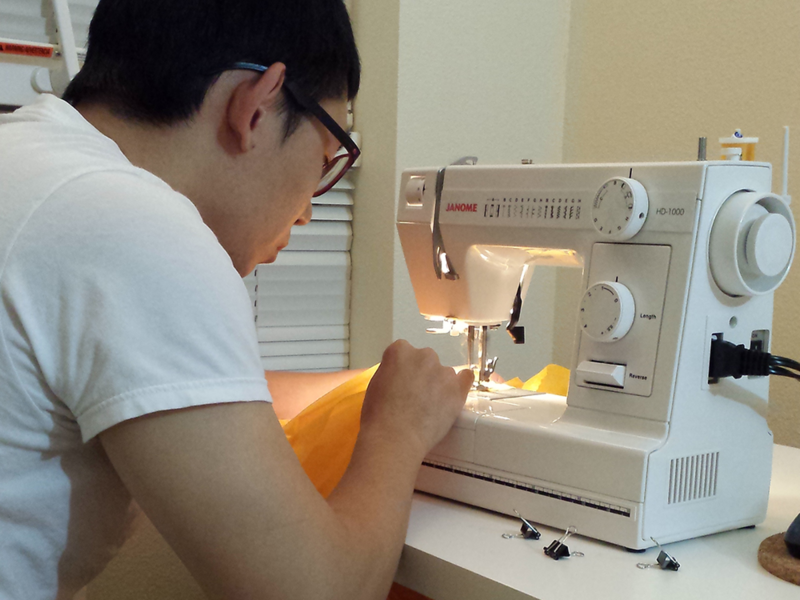 And cutting all of parts from Ripstop Fabric and assemblying them together with a sewing machine. All process was conducted by myself. For software part, Thank you duck was connected to twitter API by using Rapsberry pi*. Whenever there is a tweet to @thankyouduck along with a personal thanks message, the installed Raspberry pi fires an events to activate the installed fan to blow the air. 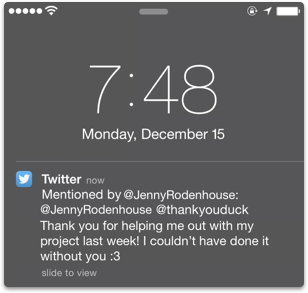 When the fan is deactivated, the Raspberry pi captures a photo of the surrounding of the Thank you duck to tweet back to the user who sents the thanks message to remind him/her to keep paying it forward. 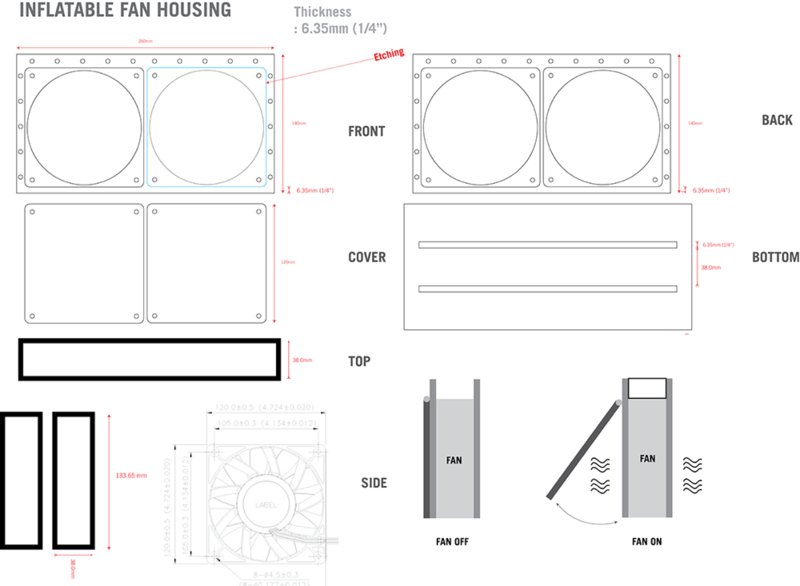 The fan housing was carefully designed to control the air flow of the Thank you duck to prevent the duck blowing out by detecting the air pressure inside of the Thank you duck. With the electric circuit design, Dan Driscoll, a software engineer at FUSE labs, helped me out. 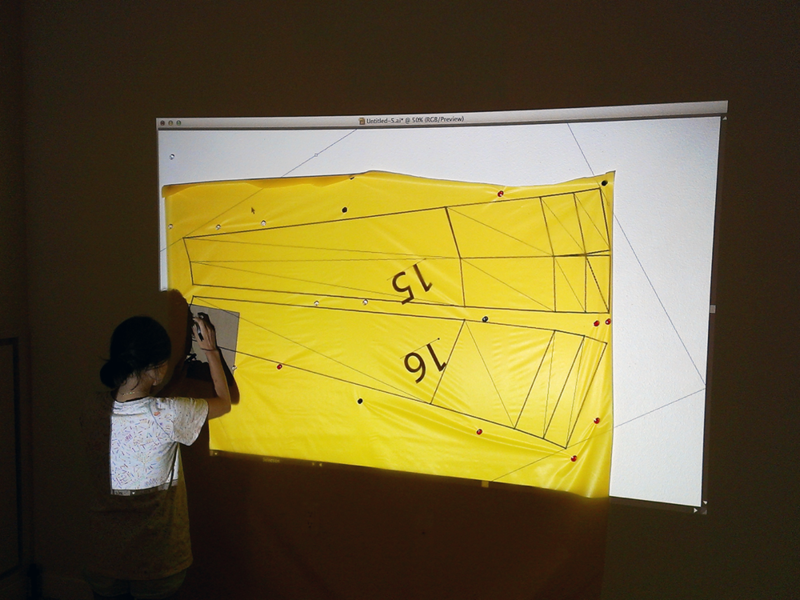 *pepakura is an origami software that transforms a 3d model into a 2d scheme for origami. *Ripstop fabric is a breathable fabric for inflatable. It’s commonly used for building windbreakers. *Raspberry Pi is a low cost, credit-card sized computer that plugs into a computer monitor or TV, and uses a standard keyboard and mouse.